Today's card is one that jumped out at me as soon as I saw the new First Edition expansion, The Gamma Quadrant. It simply demands that a deck be built around it and clearly states what that deck is to be. Enabran Tain was one of the most interesting recurring characters in Star Trek: Deep Space 9 and in no appearances was he more interesting and in control as he was in The Die is Cast. That is the episode where Tain, acting as the head of the Obsidian Order, and Colonel Lovok, acting as the head of the Tal Shiar, team up to make an attack on the Dominion Homeworld in an attempt to eliminate The Great Link. 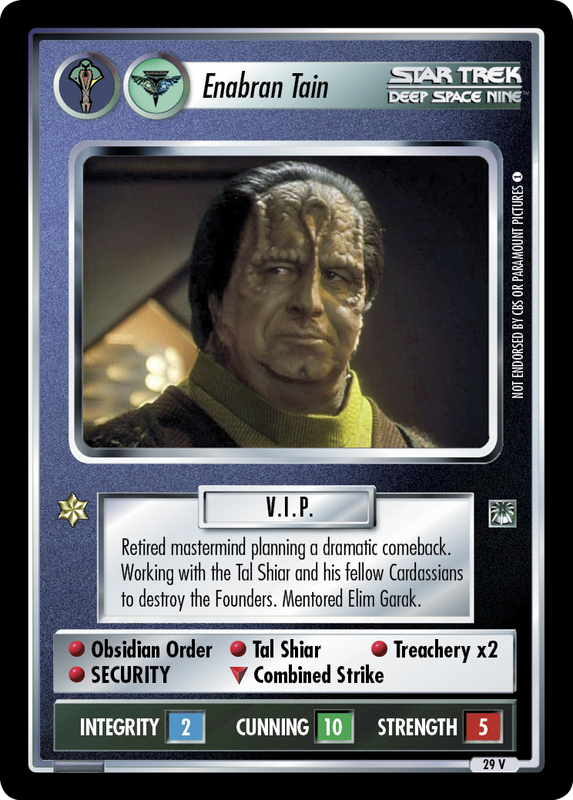 This version of the Enabran Tain persona is quite different from his original Deep Space 9 version. Most noticably, he is a dual affiliation personnel having both his normal Cardassian affiliation and the Romulan one. That's a combination that we had not yet seen. But he's a conversion! The Second Edition card was most certainly not a dual affiliation one, so lets look at the drastic transition made by Tain as he changed templates. The card was originally released way back in the second 2E set, Energize, and surprisingly it is the only Enabran Tain to be backward's compatible. This mean that all versions of the Enabran Tain persona are now in the 1E template. Like the DS9 version, this one is also a VIP classification and has a Command Star. He retains the skill of Security and both of his Treachery but has lost his Programming altogether in the change. Normally, that would have been made into Computer Skill, and certainly that will be missed as it is one of the most important skills in the game in the current meta. But what's most interesting is the conversion of his Intelligence skill. The 2E card had a double helping of this skill, but they were converted to two very different 1E Intelligences. Normally, conversion rules would dictate that Intelligence is converted to whatever version matches the affiliation of the card, but as I stated above, Tain now has two affiliations. The conversion gave him one copy of the Cardassian version of Intelligence: Obsidian Order, and one of the Romulan version of Intelligence: Tal Shiar. 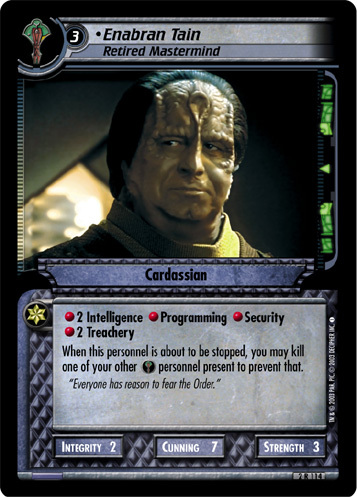 This means that he works even better in the deck that he is destined to be in: a Romulan/Cardassian Treaty deck. But it also makes him the best possible target for Mutual Distrust (a card that has not yet been revealed). The stats conversion is also rather interesting. I've noted previously that the stats on 2E cards are a bit lower than their 1E counterparts, and normally this is adjusted upward by 3 total points. But Tain's total stats have gone up by 5; this might even be the biggest increase we've seen. Not surprisingly, the Integrity has not increased at all (because he's Enabran Tain) and remains at an impressive and useful 2. Instead he has gone up 2 points in Strength (from a creaky 3 to a respectable 5) and he has gone up 3 points in Cunning (from a respectable 2E stat of 7 to the incredible 1E stat of 10). But well, he's Tain. I wouldn't be surprised if he wrote those stats himself while enjoying a late night Kanar. The final change is his special ability. The original 2E card had the ability to choose who died and who lived and who had to head to the store to restock the kanar by swapping out a personnel who was chosen to be stopped for one that Tain himself wouldn't mind seeing dead. But this trade isn't nearly as good in 1E as it is in 2E, and I doubt there would be too many instances where a player would choose to kill one of their personnel just to keep another from being stopped. Instead, the special ability is replaced by a special download of the card Combined Strike. That's a card we've not yet seen, but it sure doesn't sound like a card that includes the conversion of that ability. To me, it sounds a bit more like that one time when a fleet of Romulan ships teamed up with a fleet of Cardassian ships and decided to go attack the Founder's Homeworld.